Caption: Law Council staff meet delegates from the Hawi'i Institute for Human Rights and the Alliance for Democracy. 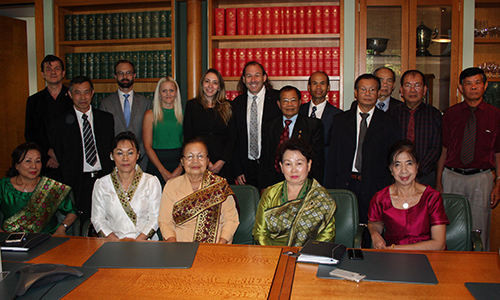 The Law Council met with representatives of the Alliance for Democracy in Laos and the Hawai’i Institute for Human Rights, in Canberra, to discuss progress towards realisation of sustainable development goals in Laos. Laos faces significant challenges in meeting these goals with delegates reporting a range of cross cutting issues including poverty, equality of opportunity, infrastructure, environmental degradation, sustainable use of natural resources, corruption, governance, rule of law and relationships with neighbours in the Asian region. An interesting point of discussion was that a large number of the issues raised by the delegation are also currently under active consideration in Australia. Despite both countries being at very different stages of development, the Law Council will seek further opportunities to exchange information and to support shared objectives.